I’m still trying to take full advantage of the fresh summer veggies before they’re gone. 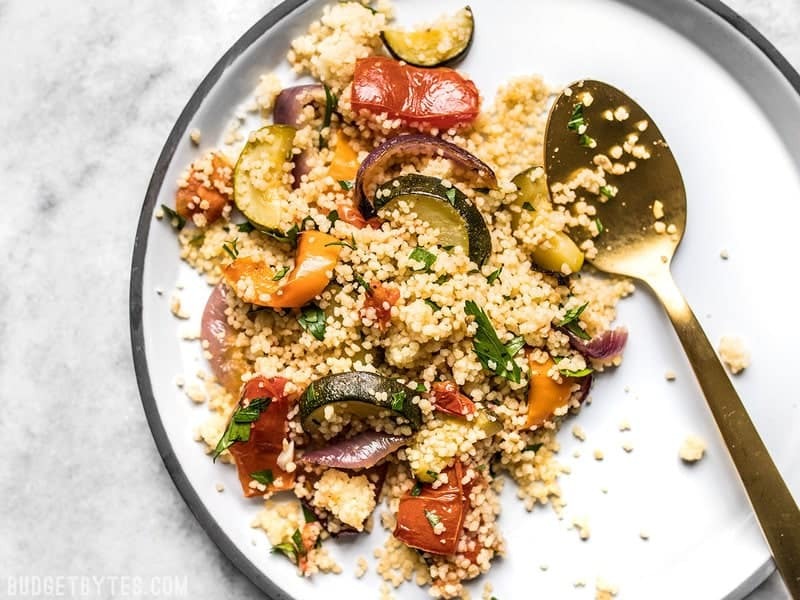 This Roasted Vegetable Couscous is the perfect side dish for the transitional season, when the markets are still full of fresh beautiful produce, but it’s not so hot that you don’t want to turn on your oven. This simple side dish is easy to prepare, but boasts complex and vibrant flavors. 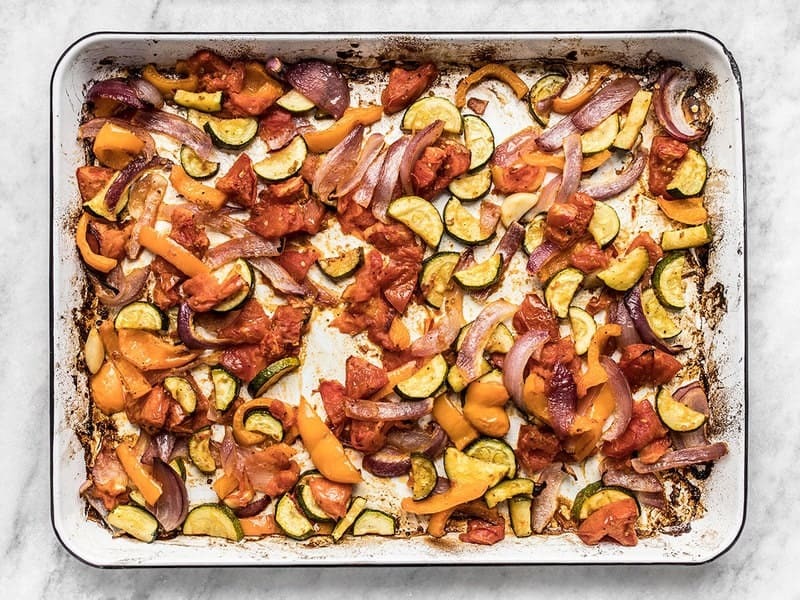 That being said, if it is still too hot to roast your vegetables in the oven, you can make this dish just as easily by grilling the vegetables outside on your grill. 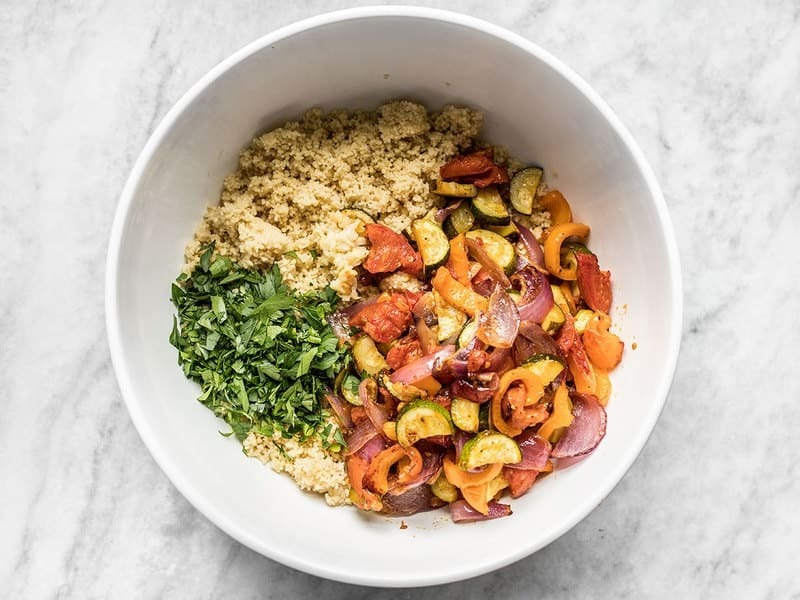 Either way, you’ll get that wonderfully sweet caramelized smoky flavor on the edges of the vegetables that contrast so well with the savory couscous. Originally posted 8-29-11, updated 9-10-18. 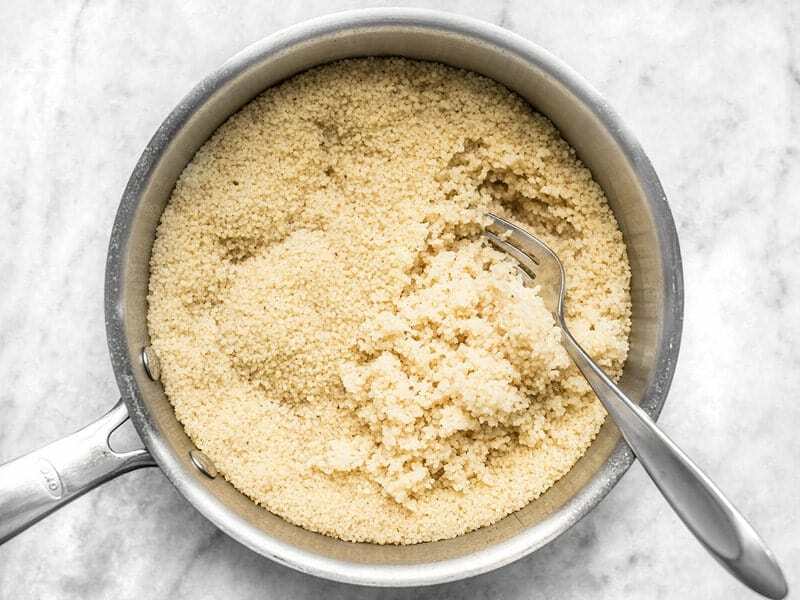 If you’re unfamiliar with couscous, it’s kind of like small granules of pasta. 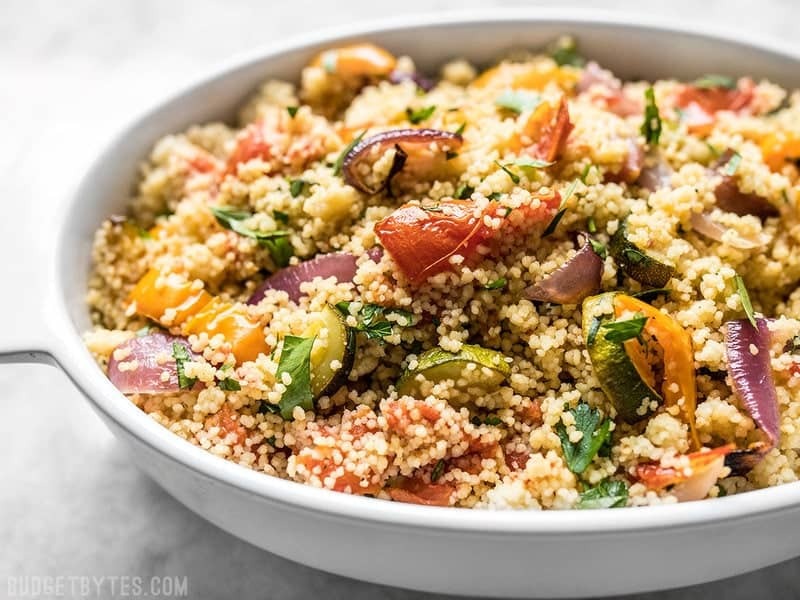 Technically couscous is not a pasta because it’s not made from a dough, but from rolling small bits of crushed durum wheat semolina in flour until it forms the tiny granules. Because the small granules are so tiny, it produces a wonderfully light and fluffy mixture once cooked. 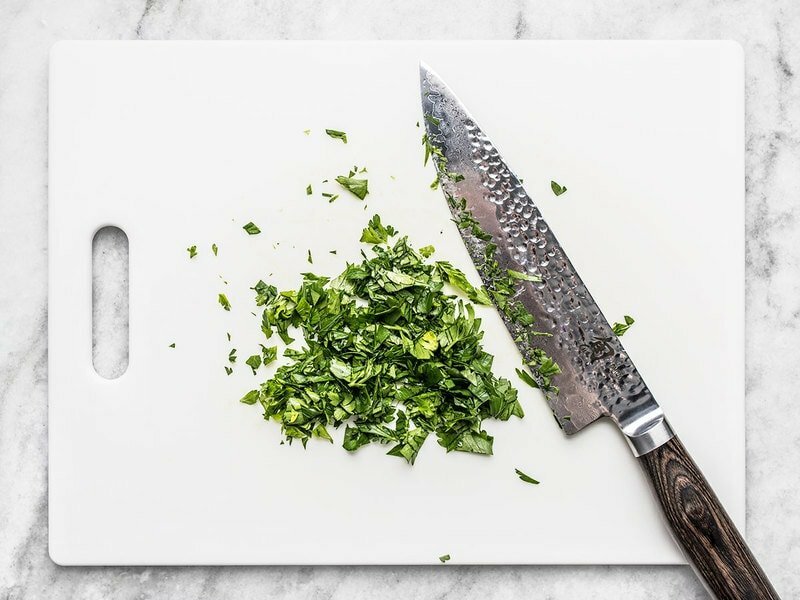 It’s perfect for mixing with vegetables, herbs, fruit, meat, or even nuts. Cooking Couscous is extremely easy. 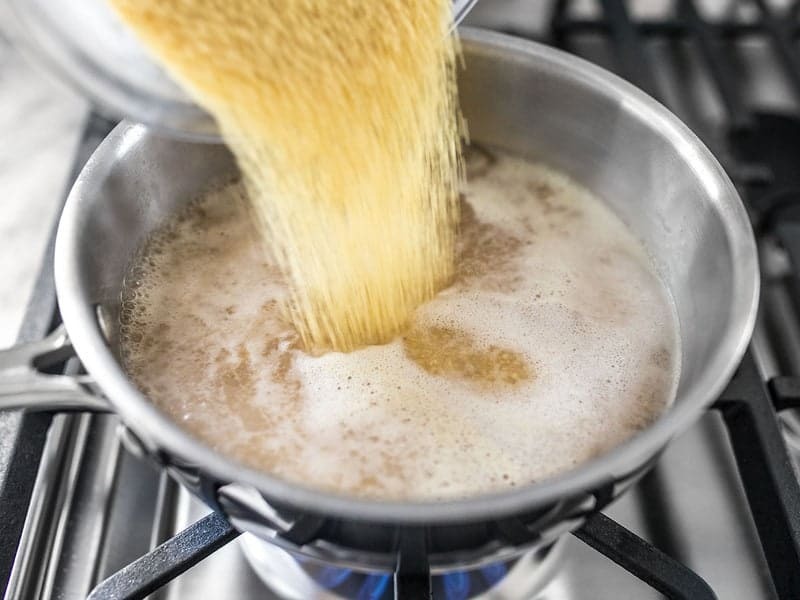 Simply pour the couscous into boiling water (1 part couscous to 1.5 parts water), place a lid on top, turn the heat off, and let it sit undisturbed for ten minutes. The couscous will quickly absorb the hot water. After ten minutes fluff, then serve! You can flavor couscous by cooking it in flavored liquids, like the vegetable broth I used here. 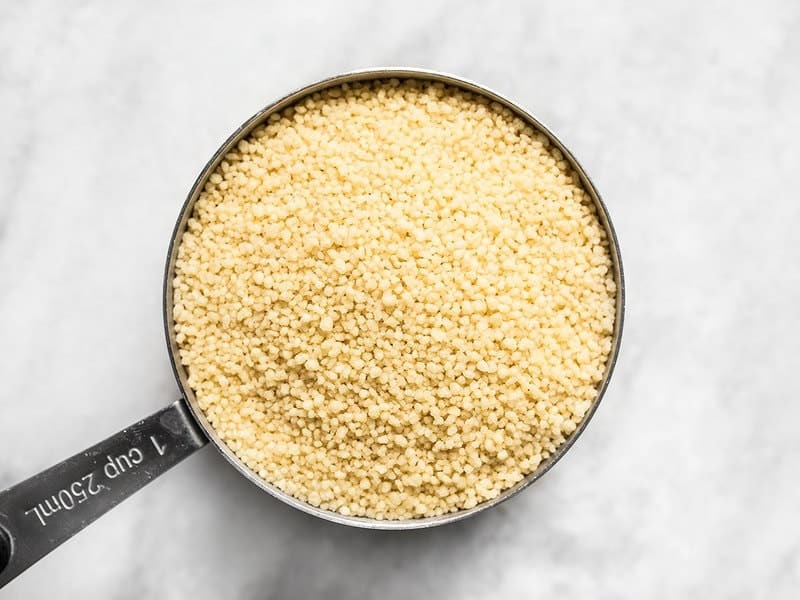 Larger varieties of couscous, like Israeli couscous, or varieties made with whole wheat semolina, may have slightly different cooking instructions. Yes! You can use pretty much any vegetable that you have available to you, but I like to make sure I have at least three colors for maximum visual appeal. Some other vegetables that are wonderful in this mix are: eggplant, yellow squash, mushrooms, or broccoli. If using hard vegetables, like root vegetables, you may need to cut them slightly smaller to make sure they soften. 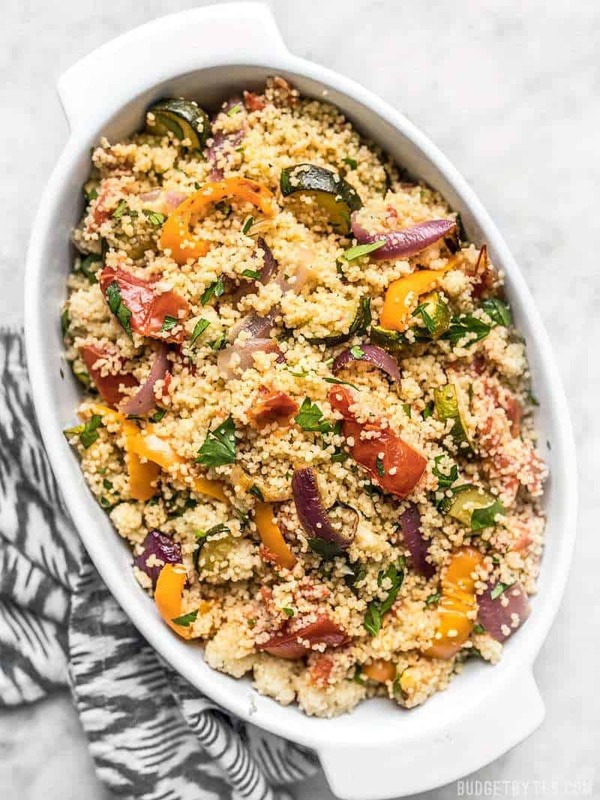 Roasted Vegetable Couscous is an easy side dish with complex flavor, with sweet roasted vegetables mixed with savory, fluffy couscous. Place the vegetables in the oven and roast at 400ºF for about 45 minutes, stirring twice throughout, until the vegetables are wilted and browned on the edges. These are the vegetables that I used for my couscous today, but you can be flexible with the vegetables in this dish. Use whatever you have on hand or whatever is available at a good price! Preheat the oven to 400ºF. 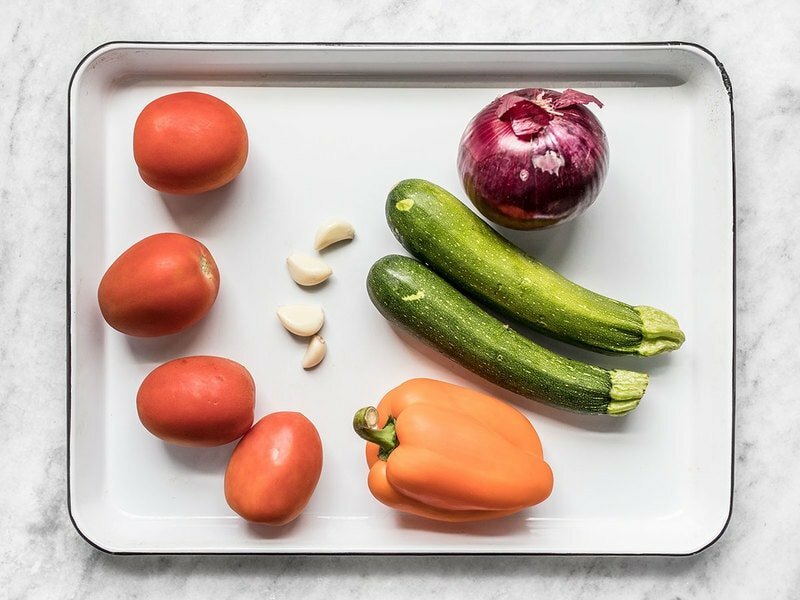 Chop the vegetables into 1 to 1.5-inch pieces. Peel the garlic, but you can leave it whole so it roasts and becomes nice and sweet. 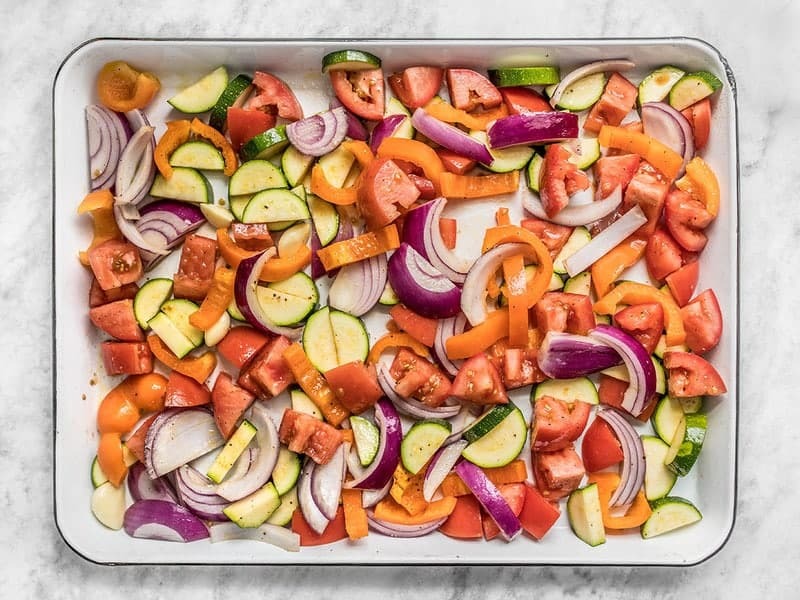 Place the vegetables (and garlic) on a large baking sheet, drizzle 2 Tbsp olive oil over top, and add a couple pinches of salt and some freshly cracked pepper. Toss until the vegetables are well coated in oil. Roast the vegetables in the preheated oven for about 45 minutes, stirring a couple of times throughout, or until they are wilted and browned on the edges. Pick out the whole cloves of garlic and mince them. While the vegetables are roasting, cook the couscous. This is what couscous looks like uncooked. Very small, irregular granules. You can usually find this in bulk bins, or sometimes near the pasta or boxed pasta and rice pilaf mixes (although boxed versions are always much more expensive than bulk varieties). Bring 3 cups vegetable broth to a boil over high heat. Once boiling, pour in the couscous, turn the heat off, replace the lid, and let the couscous sit undisturbed for 10 minutes. The couscous will absorb the hot water as it sits. Once the couscous has absorbed all the broth, fluff it with a fork. Chop about 1/4 bunch fresh parsley. 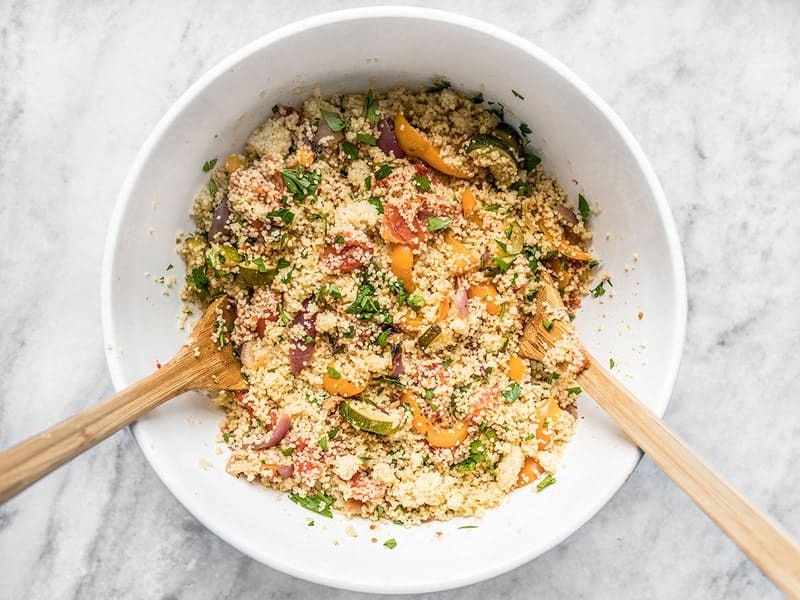 Once the vegetables are roasted, couscous is fluffed, and parsley is chopped, combine them all in a large bowl. 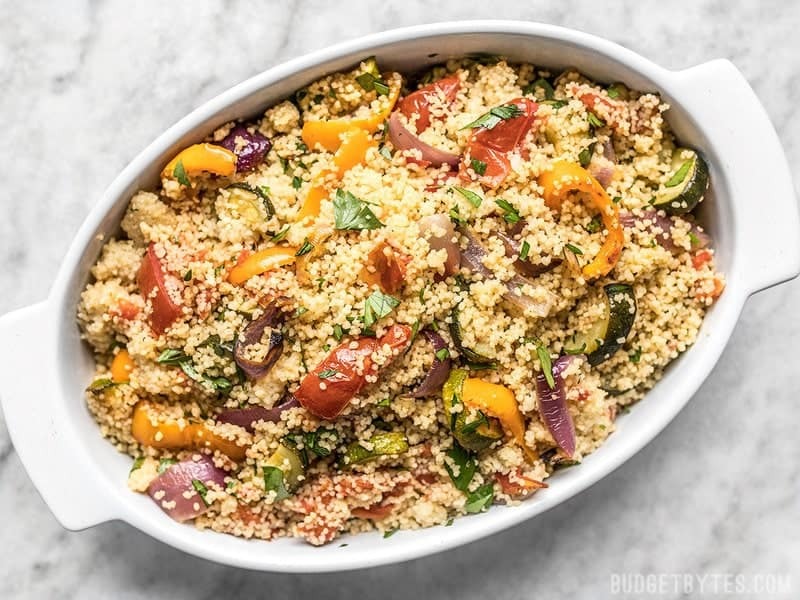 The post Roasted Vegetable Couscous appeared first on Budget Bytes.